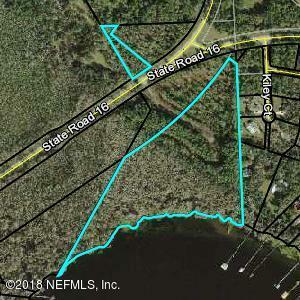 A large waterfront parcel is now availableafter the DOT has taken appx 4 acres at the road for the future Outer Beltway Expressway.There is a nicely treed upland area connected to wetlands along significant frontage on the waterfront Multiple uses are considered under the proposed ''OR'' zoning designation....Fish Camps, Horse Farms and more are allowed or a perfect place for a rambling waterfront Estate. . There are muitiple maps attached that will show the Outer Beltway, a modern roadway that will connect to all areas in North Florida. Appx 7.36 acres uplands. 1600' + on the river.